Seasonal Pitches available for 2019. Please email for Park Information and Guidance plus a Park Plan showing available plots. Seasonal touring pitches allow you the flexibility to come to your caravan when it suits you. You have your caravan set up on a pitch, you can leave your awning up and all you do is drive here (minus the towing!) and … relax. There is a 7 month season and a 5 month storage facility available outside of that time. We have different areas aimed at different holidaymakers. We have a quieter, low key area aimed at couples, areas near to a play park and end of row tranquil culdesac locations. Our park is also dog friendly. Season 2019: 29th March – 31st October. £1850 per season inc. 20% vat. and including your electric usage. Winter storage is available at approximately £150. One household per caravan. Shared pitch rates available. Please note that we do not accept Hobby or Tabbert caravans and caravans must be less than 15 years old when coming to pitch with us for the first time. 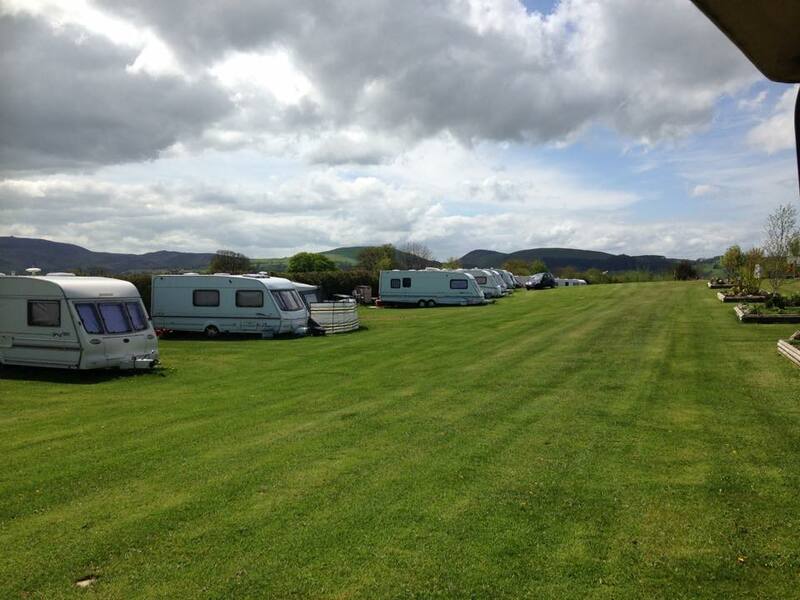 Once on a pitch there is no age restriction but caravans must be kept clean and tidy. Our Park information and Guidance sheet will give you all the details. 4G mobile phone coverage here. Free WiFi for up to 4 devices. Two toilet shower blocks with Free Hot Showers and dishwashing facilities. Washer / Dryer Coin op facilities. We are a working farm with animal viewing areas. Owners live on site plus Park Warden on site 24 hours. Schedule of events ranging from Easter Activities, Farm focused Activities, Cowboy Night, Karaoke and Halloween Event… plus much more. Extensive walking areas around the Park and around the farm fields on public footpaths / defined routes. Fron Farm is a working farm so cows, sheep, horses, pigs and hens are in nearby locations plus lambs in the Spring. Dog friendly with defined walking areas and paths. Walking access to the Coed y Felin Nature Reserve with stream and park benches for picnics. Smooth tarmac roads on the park – all pitches are on well drained grass. Just 10 minutes by car to the thriving Market town of Mold. Market days are Wednesday and Saturday. All major shops are in Mold. A large selection of nearby recommended eating places to choose from. A comprehensive leaflet is available at Reception.